Lee Or readies to hit a forehand shot. The junior clinched the Wildcats’ undefeated Big Ten regular season last weekend, propelling the team into the tournament with momentum. 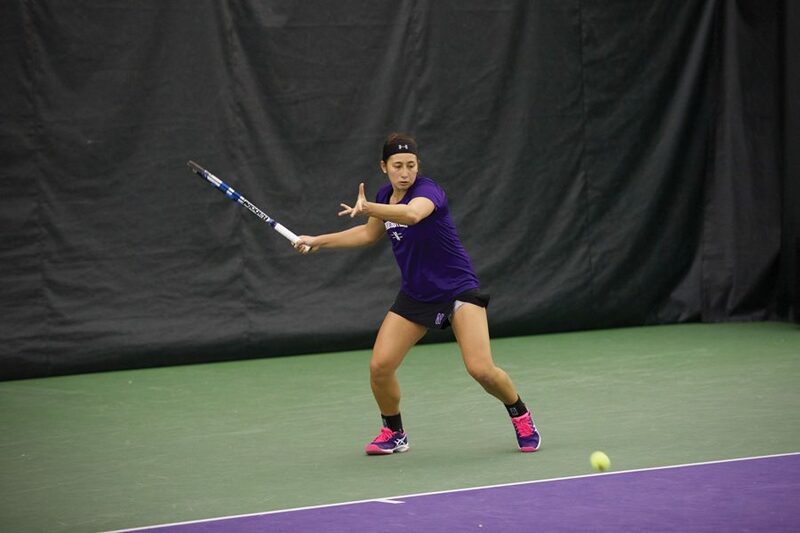 Northwestern will travel to Minneapolis, Minnesota, to compete in the Big Ten Tournament this weekend. The No. 12 Wildcats (19-4, 11-0 Big Ten) head into the postseason on the back of a successful regular season. They have won 16 of their last 17 matches, including an undefeated run in Big Ten play. NU has been impressive in both singles and doubles, and its top three singles players all appear in the national singles rankings. Seniors Erin Larner and Maddie Lipp are currently 37th and 78th, respectively, while junior Lee Or sits at 121st. Or clinched the perfect Big Ten regular season last week against Ohio State in a competitive three-set match. After blowing three match points at 5-2 in the third set, Or pulled through and shortly after celebrated with her teammates. This marks the first season since 2009 that coach Claire Pollard has led her team to an undefeated conference record during the regular season. The Cats will look to break another streak this weekend by advancing to the finals of the Big Ten Tournament. NU has not returned to the tournament title match since winning it at home in 2014. The Cats’ first opponent will be the winner of ninth-seeded Maryland (10-12, 4-7) and the host, eighth-seeded Minnesota (14-11, 6-5). Both matchups resulted in 6-1 wins for NU during the regular season, and in both instances, it was senior Alex Chatt who lost the lone point. If the Cats advance to the second round, they will meet either fifth-seeded Purdue (14-9, 7-4) or fourth-seeded Ohio State (13-7, 7-4), ranked No. 28 in the country. Earlier in the season, NU blanked the Boilermakers, losing just one set that day. On the other hand, the Cats scraped past the Buckeyes just last week in a competitive 4-2 victory. Regardless of who they play, the coach said the team is confident about the weekend because they are not scared of any team.